First wash and clean the fish pieces in water. In a bowl mix together corn flour,rice flour,red chilli powder,ginger/garlic paste,ajinomoto,egg,salt,food colour and fish pieces. Cover with plate and keep it for 4 to 5 hours. Heat oil for deep frying in a wide and deep bottomed vessel.When oil is hot,Lowe the flame,and drop in the fish pieces slowly into oil. Now the fish pieces in 2 pieces in low heat in till they turned light golden color. Place it on serving plate. Wash and cut the tindora and potatoes into even strips or long chips. Heat oil in a pan,when oil is hot add mustard seeds,cumin seeds and when it popups now add hing and curry leaves. Then add potatoes and fry for 5 minutes. After add the tindora,salt,turmeric powder mix well. Cover the lid cook until they are soft. Now add red chilli powder,coriander powder,cumin powder mix well .Fry for till its crispy. Now turn of the flame and serve with hot rice or rotis. Soak Urad dal for 2 hours.Grind to smooth paste. When it smooth now add enoguh salt and grind again 5 minutes to vada consistency. Whisk yogurt with 1 1/2 cup of water and salt mix well. Heat 1 tsp of oil and add seasoning items and fry to turn brown and add salt seasoning to curds. Heat oil in a deep kadai. Keep aside a water bowl to dip hot vadas after removing from oil. On a wet plastic papper or in u r plam,take a small size ball and press gently and make a hole to shape like vada. Drop and fry vadas in oil 4 to 5 at a time to turn light brown on a moderate heat. Remove vada from oil and drain oil. Transfer hot vadas to water immediately.After 2 to 3 minutes,transfer the water soaked vadas to seasoned curds. Finish all vadas like this. 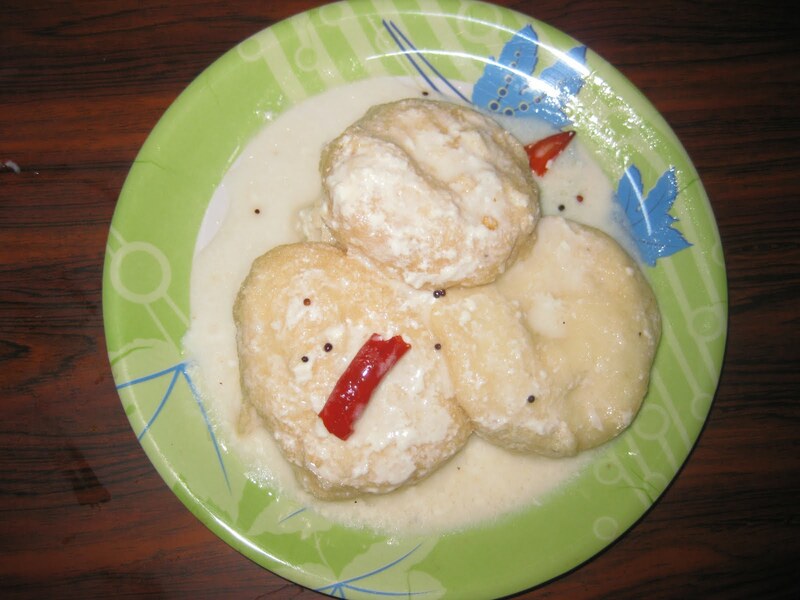 Leave Vadas in yogurt for 5 hours so that Vadas can absorb yougrt and become very delicious. Chill the vadas before serving. At the time of serving place 3 or 4 vadas in a small plate and granish with red chilli powder,chaat masala powder,fresh coriander leaves,peas curry and sev. U can have plain dahi vadas also.. This dish is simple and easy to make.Filled with nutritive vegtables,this can me made in less than 20 minutes.Andhra Paradesh is famous for stews and pulusu is one of the famous dishes from Andhra Pradesh.Pulusu is a genral word used for any kind of stew.Main ingredients in a stew are varity of vegtables,tamarind pulp,jaggery.Stew are also made with leafy vegetables like thotakura,spinach. Clean and chop all the vegetables into big chunks,Slit green chillis. Heat oil in a thick bottomed pan and add the seasoning.When the mustard seeds splutters,put the vegetable pieces,turmeric and salt. Mix well and allow it to cook covered on a low flame for two minutes. Then add a cup of water and cook them till soft.Do not overcook,vegetables will lose their shape. Then add tamarind pulp,jaggery and water. mix well. Allow it to cook for ten minutes.Turn off heat.Garnish with fresh coriander and keep covered for 5 minutes before serving. Serve with hot rice.This is usually eaten with mudda pappu and papad or vadiyaalu. Note-u want thick constistency u can do 1 to 2 tsp spoon mix besan in some water.slowly stir in the besan mixture into the pot.This is a no onion and no garlic dish.